At long last, some structures have begun to appear on the GIRR. 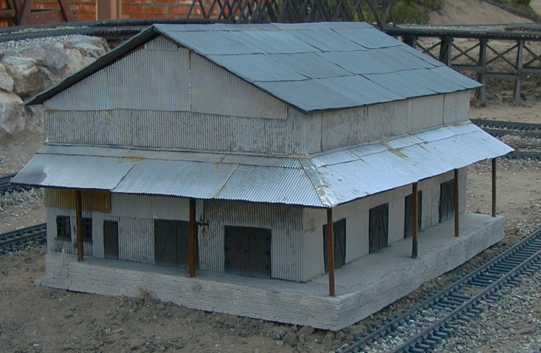 Of necessity, most of the structures are scratchbuilt because its hard to find 1:29 or 1:32 scale kits. Also, the structures are all intended to be left out in the weather all the time, so that the construction techniques that are available are somewhat limited. 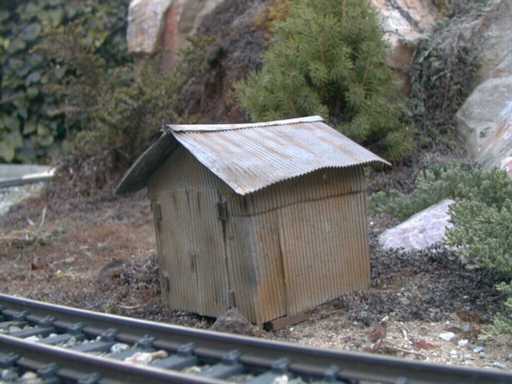 The first building to appear on the GIRR was this little tin shack made from corrugated aluminum cans. At the time that this picture was taken, the building had been outside for about 2-1/2 years. During that time, its painted weathering had been naturally weathered such that the artificial weathering had to be done again. Other than that, it has held up well. 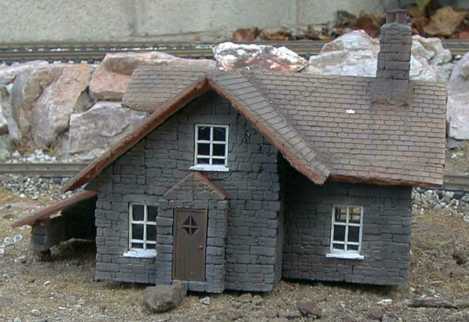 A JigStones farmhouse was the second building to be placed on the layout. For the time being, "placed" is the right term. No attempt has been made to integrated it into the surroundings until a little more development takes place. For right now, its getting naturally weathered. The Floquil paint used to paint and weather the building is being weathered itself and the roof is heavily faded. The next structure was this warehouse also made from corrugated aluminum cans. This structure covers an awful mess of wiring out in the middle of the layout. This set of storefronts is a Mountains-In-Minutes polyurethane foam building front. The structure has three walls and a roof. The buildings come with metal window frames and cellophane window glazing. They are painted primer gray. 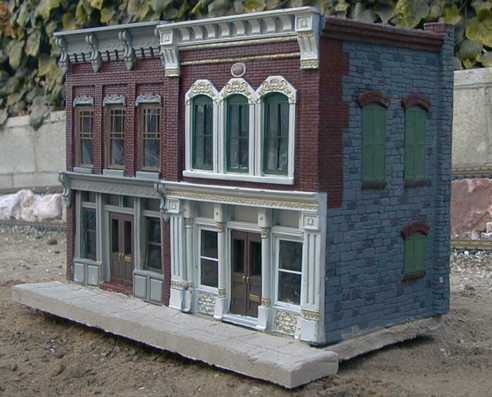 The detail on this inexpensive ($40) building is very good, I really liked the moldwork. It is also quite sturdy as the walls are nearly an inch thick. 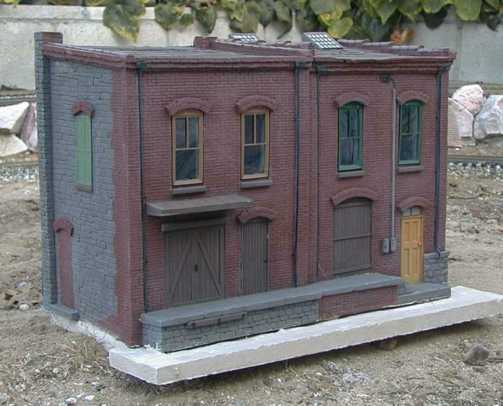 It is also acceptably close to 1:29 scale based on the door size that I thought it would look good on a 1955 vintage 1/29 scale layout as a 60 year old building. Another building is this set of building backs. The set is designed so that they can be glued together into a single building but since they would not be visible on the "back" side, I elected to leave the backs plain. The sidewalks on both buildings were made from RapidSet cement cast in a wooden form around the Wonderboard floor. 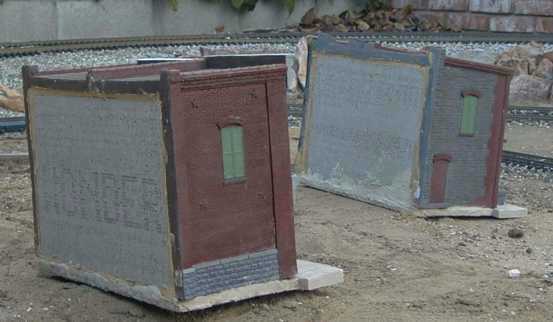 The backs were filled with Wonderboard, a concrete and fiberglass product designed to back tilework. Wonderboard scribes and breaks well and can be found in most homeowner stores. Another piece of wonder board is used as a floor. Both pieces of Wonderboard are glued in place with liberal amounts of Liquid Nails adhesive. Since Wonderboard is very porous on the broken edges, I sealed the edges with a layer of RapidSet cement.